Southwell’s recorded history begins with the Roman Empire, when there was a large manor located where the north and east ends of the Minster and the Residence now stand. Because the remains of the manor are overlaid by such distinguished buildings, there has been relatively little excavation of the site, but a fragment of one of the mosaic floors can be glimpsed below the floor of the stalls in the Minster’s south transept. The records relate that archbishop Oscetel was granted the manor in AD 956, and that the estate was doubled to 20,000 acres or so after the Norman conquest. Successive archbishops of York found Southwell a convenient staging post in their journeys between York and London and built a manor house here alongside a splendid Norman collegiate church. For centuries, the archbishops were lords of the manor, while the more eminent local families were episcopal officers in one capacity or another. The canons (priests) of the collegiate church derived their incomes from various villages round Southwell, which are still recalled by the names of several prebendary houses in Church Street and Westgate. Nottinghamshire was in the front line in the Civil War (1642-49) and Southwell saw some of the action, particularly during the siege of Newark, when there were skirmishes through the country roundabout . 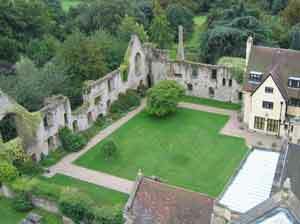 The Minster suffered some damage and the archbishop’s decaying manor house was gutted. In 1646 Charles I is said to have spent his last night of freedom at the Saracen’s Head before surrendering to the Scots. In the seventeenth and eighteenth centuries several secular families rose to prominence in the town from service to the archbishops’ estate, notably the Bechers, Clays, Lowes, Hodgkinsons, and Barrows. They built more prestigious houses in the central area of the town, particularly on the Burgage, Burgage Lane and Westgate, mostly in the period 1780-1820, when the town was a fashionable location for ‘genteel’ families. The families subscribed to the Assembly Rooms next to the Saracen’s Head, where they enjoyed polite amusements like dancing and cards. 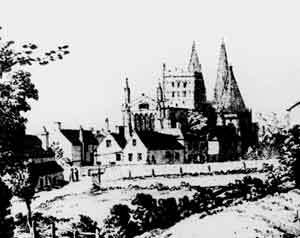 The centre of Southwell round the Minster was necessarily devoted to the church, but the satellite settlements of Easthorpe and Westhorpe, and the banks of the River Greet, had a population of families employed in industry and trade. Framework knitting, took hold in the early-eighteenth century alongside the traditional weaving industry. This gave rise to an impressive Arkwright-type cotton mill built on the Greet at Maythorne, just outside the town in 1784. When knitting hosiery suffered a setback at the close of the French Wars (1815) due to changes in fashion, smock making became an important local industry here and at Newark. Meanwhile, Southwell had developed its first agricultural specialism, growing hops, which gave rise to a malting industry in the town. People who walk the area with the aid of the Southwell Heritage Trail leaflets (available from The Minster Centre, Church Street) will discover evidence of a range of lost industries in and about the town. Successive archbishops of York were major political as well as ecclesiastical figures so that Southwell became a centre of civil administration for the surrounding part of Nottinghamshire from an early period. The ‘eminent families’ of the town mentioned earlier were JPs responsible (with others) for the government of the county for generations. This is why the House of Correction was built here, along with its forbidding partner, the Workhouse, both by a zealous local justice, Reverend J T Becher. He was also vicar-general of the Minster, a power in both church and state. The working-class life of the town was centred, not surprisingly, on the many public houses. Recent research has identified that there were 17 of them . Actually they had a wide range of functions apart from serving drink and (sometimes) food. They were busy commercial and coaching centres, and places where a variety of groups met, from ‘gentlemen florists’ to pioneer trade unions. The ‘Saracen’s Head’ is the oldest of Southwell’s public houses and inns.